Discussion in 'Guides, Mods, and Upgrades' started by Halvard Fosse, Mar 6, 2016. A little how-to guide on how to enable automatic bed leveling for the BigBox Dual. Copy library and hardware from this to your arduino installation folder. Connect you BB to you computer through USB, and select the correct com port. Rob Heinzonly, Madeinoz67 and Hans C. like this. Thanks ! This will be very useful. Whilst this is a good tip, I would say that I suspect Greg would probably caveat this by saying that the automatic measurement and resultant mesh isn't as good as the manual method. I don't know how much of a problem this would/could cause with dual colour printing however. When you use the manual bed leveling, you are still just calibrating one of the nozzles. The biggest difference is that the configured manual mesh uses 9 setpoints, and the automatic leveling I described above uses 4 setpoints. But this can be adjusted in software if you need/want/require more. So based the behavior I see on my printer, it seems to work remarkably well. I calibrated the second nozzle of the first nozzle with the use of a feeler gauge and a few print tests, and it all seems to work. I would say this is the wrong direction to go in. The reason they use mesh on the Dual and Simple is because it's the superior method. They only use ABL on pro because they advertised it as such. The mesh manual bed leveling is a great improvement, if anything this thread should be how to convert from ABL to MBL. I'm a little surprised that the bed levelling cannot be done independently for each nozzle, and then use motor control to create a slightly off-level bed for the purposes of dual printing. We know that even on a completely unlevel bed, the printer will happily print perpendicular to the plane. And we know that having another nozzle in the way is surefire way to kill a print. So why not have bed leveling per nozzle and rock the bed to get the best result? You'd need some way of controlling the Z motors independently at the very least, which right now is not an option. It's best to have the nozzle be at the same height. Yeh. Come to think of it, I now recall the part of the build where the z motors are both connected to the same motor control. OK. Well that confirms it. You have to level the bed to the nozzles. OK. I'll go forward with that and actually start to do some dual printing. One other thing which I find a little odd is that, with even a slight difference in height on nozzle 2, when that nozzle is on the bed, the right hand size screw is right at the top, actually touching the top. I think I want a touch more room. Is there anway to fix that? 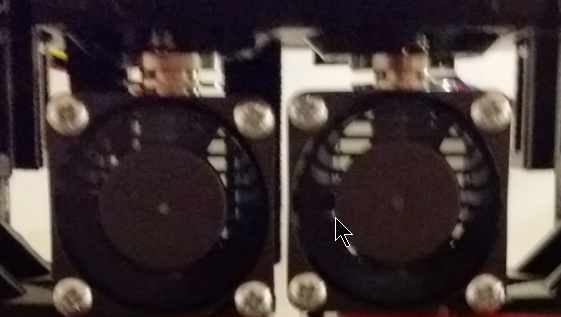 Have I buried my heatsinks too far ? Hmm you might reduce the tension a bit on them. The o-rings are in right? I'm a bit confused by "Right hand size screw is right at the top"
Sorry, I don't have all the right terminology yet. The bed, on the screw, is touching the printed part at the extreme point at the top of it's movement path up the screw. I read that back and its still not great. Do you get my drift? The brass lead screw nut. That one. Do you possibly have the nut on the wrong side of the carriage? Nope - looks just like that. Don't worry about it. Now I've unscrewed the hex nuts, that brass in the picture nut no longer hits the roof. It's all good here. Thanks.